1894: The Omaha Bee has a decidedly pessimistic preview of the upcoming football season at Nebraska. 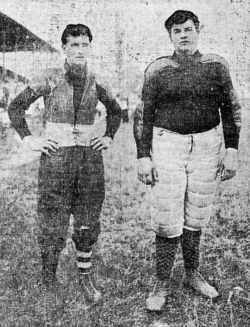 «1904: Nebraska lineman Leslie Mills gets noticed because of his eye-popping weight: 265 pounds. Meanwhile, the Cornhuskers open the season with a 72-0 romp over Grand Island College but then have a tougher time in an abbreviated game against Lincoln High. 1954: Nebraska takes a 7-6 lead into the locker room, but Minnesota wears down the visiting Huskers in the second half and pulls away for a 19-7 victory. The Huskers' only touchdown came on 48-yard run by halfback Ron Clark, who finished with 110 yards despite being troubled by a leg injury. 1959: Nebraska recovers five Minnesota fumbles and intercepts three passes in a 32-12 road win over the Golden Gophers. Clay White had three second-half TDs after Nebraska led 13-12 at halftime. In addition to the turnover advantage, the Huskers had a 233-179 yardage edge.  Also, former Husker football and baseball captain Buck Beltzer dies at age 71. 1964: After tailing by 21-12 with less than eight minutes left, the Huskers rally for a 26-21 win at Minnesota behind Fred Dudas hot passing hand. 1974: Favored by 15 points but missing the services of quarterback Dave Humm for most of the game, the Huskers lose at Wisconsin, 21-20, on a 77-yard pass in the final four minutes. 1979: The Huskers overcome a 21-7 deficit in the final 20 minutes to win at Iowa, 24-21. 1984: Nebraska dominates No. 8 UCLA at the Rose Bowl, 42-3, as the defense registers eight QB sacks. 1989: Ken Clark rushes for 100 yards as the Huskers roll at Minnesota, 48-0. 1994: The Huskers crush Pacific, 70-21, but the big news is that Tommie Frazier might be done for the season because of a blood clot in his right calf. 1999: Nebraska wins easily at Missouri, 40-10. 2004: Two weeks after withdrawing from classes at Nebraska, Richie Incognito enrolls at Oregon* on an athletic scholarship and awaits clearance to practice with the Ducks. 2009: The Huskers and many of their fans sport a retro look for Nebraska's 300th consecutive home sellout, a 55-0 win over Louisiana-Lafayette.